The Fifteenth Gyalwa Karmapa, Kunzang Khachap Dorje, was born in the village called Shelkor that is situated in the Tsang Province of Central Tibet. His father’s name was Nyendrag Wangpo, and his mother’s name was Kalzang Drolma. He was born with the very auspicious circle of hair between his eyebrows, which is one of the thirty-two marks of a Buddha and reciting the six syllable mantra of Chenrezig. When he was four years old, he was recognised and enthroned with the Black Vajra Crown of the Gyalwa Karmapas at Tsurphu. 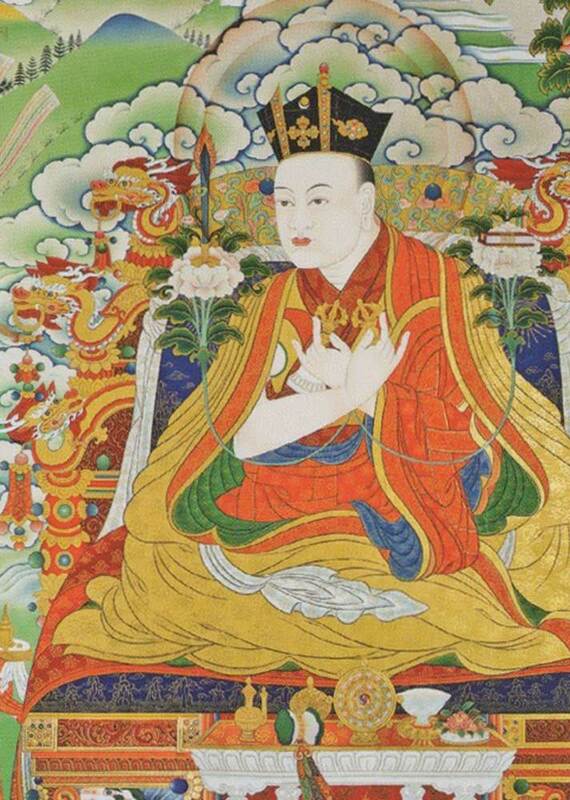 Khachap Dorje grew up receiving the best education from the foremost scholars in Tibet. His root Lama, Jamgon Kongtrul Lodrö Thaye transmitted to him the sacred oral empowerments and instructions, as well as the essence of his more than ninety compositions. The works consist of the general and profound instructions of all Tibetan Buddhist traditions, as well as the fields of medicine, art and linguistics. Khachap Dorje studied with many other great masters, such as Jamyang Khyentse Wangpo (one of Jamgon Kongtrul’s main Lamas), Kyabgon Drukchen, Mingyur Wangi Gyalpo, Pawo Tsuglag Nyinje and Tashi Öser . 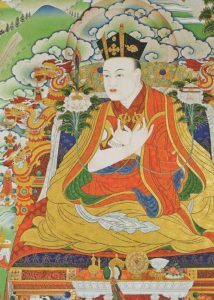 Khachap Dorje is the first in the line of Karmapas to take a consort, something he was urged to do in order to prolong his life and activity. He also had children, with one son being recognised as the Second Jamgon Kongtrul Rinpoche, Palden Khyentse Öser, and another as the Twelfth Shamar, Jamyang Rinpoche. Kunzang Khachap Dorje unfailingly continued carrying out the activities of the Gyalwa Karmapas by teaching and giving empowerments throughout Tibet and he preserved many rare texts by having them printed. His own writings make up ten volumes. Apart from his sons, his main students were Pema Wangchuk Gyalpo (the Eleventh Tai Situpa), Tsuglag Nangwa Wangchuk (the Tenth Pawo Rinpoche), Chökyi Gyamtso, Dragpa Gyamtso, and Jampal Tsultrim. Having unwavering devotion to his Guru and compassion for all living beings, the life of the Fifteenth Gyalwa Karmapa was a perfect example of a Bodhisattva who had an insatiable interest to learn in order to help everyone. Before passing into Parinirvana at the age of fifty-one, he entrusted a prediction letter to his closest attendant.